Yakima, WA – National Nutrition month evolved from what started as a week-long event back in 1973. By 1980, public interest in nutrition was growing and “National Nutrition Week” became a month long observation. This annual nutrition education and information campaign focuses on informing the public on how to make knowledgeable food choices as well as healthy physical activity habits. 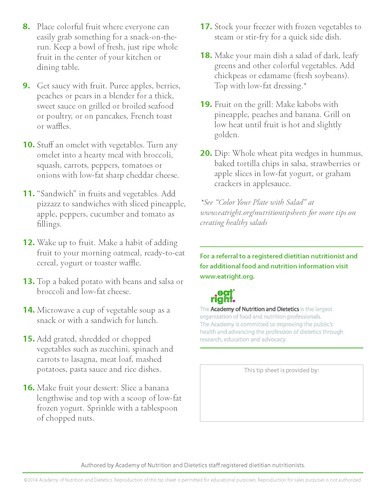 To learn more about “National Nutrition Month” please see link: http://www.nationalnutritionmonth.org/nnm/. Borton Fruit is gratified in knowing we produce products that fall into a highly nutritional category. When making healthy eating choices; Apples, Pears and Cherries seem to be continually mentioned in many facets for multiple reasons. Please see the following link for more detail on Nutritional information and health benefits: http://www.bortonfruit.com/fruit/recipes.html. There are benefits to all fruit and vegetables and increasing consumption should be a priority for all of us. The USDA implemented MyPlate back in 2011, which replaced the old MyPyramid image used before to determine primary food groups and daily consumption. As you can see in the picture below, the ChooseMyPLate.gov image shows a plate that is half covered with fruits and vegetables, tying in with the half my plate recipe’s created by the Produce for Better Health Foundation. MyPlate provides practical information to the public to help consumers build healthier diets with resources and tools, nutrition education, and recipe’s to make healthier food choices for themselves and their families. To learn more please visit http://www.choosemyplate.gov/. So how can we increase our Fruit and Veggie consumption? Dedicate half of your plate, each meal, to fruits and vegetables. Utilize websites like the Produce for Better Health Foundation’s, fruits & veggies – more matters site that provides tips on preparation and storage for better keeping; http://www.fruitsandveggiesmorematters.org/top-10-reasons-to-eat-more-fruits-and-vegetables. Be creative, there aren’t many dishes you can’t add fruits and vegetables to. 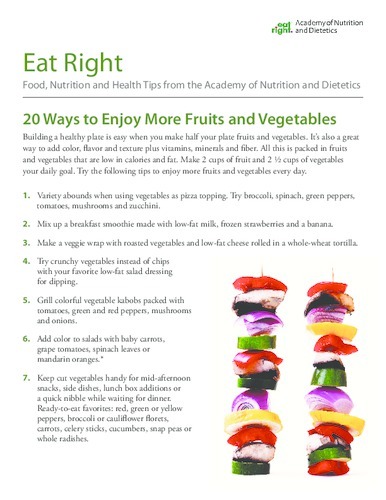 Visit http://www.eatright.org/ for access to many different links similar to the below tip sheet providing 20 ways to enjoy more fruits and vegetables. Increasing your Fruit and Vegetable consumption is a great first step to getting your health back on track. Borton fruit would like to wish everybody a happy and healthy National Nutrition Month!